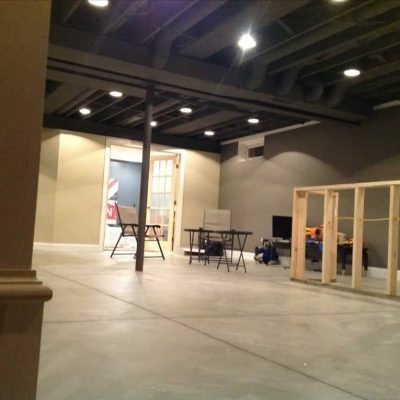 Here is a photo progression showing the progress we made in our industrial basement remodel. We are still trying to furnish this, but it looks so much better than before! When I built this house, I paid extra to replace the partial crawlspace with a full, open basement. I also added a 4 foot extension to our floorplan (which made this area even wider). And I paid extra to have 9 foot ceilings. 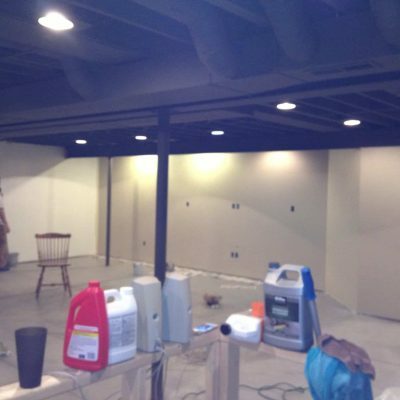 When we finished the basement we left the duct work exposed and spray painted the ceiling (which saved us about $2500 in drywall costs). As the kids got older, it was time to give them their teen hangout. 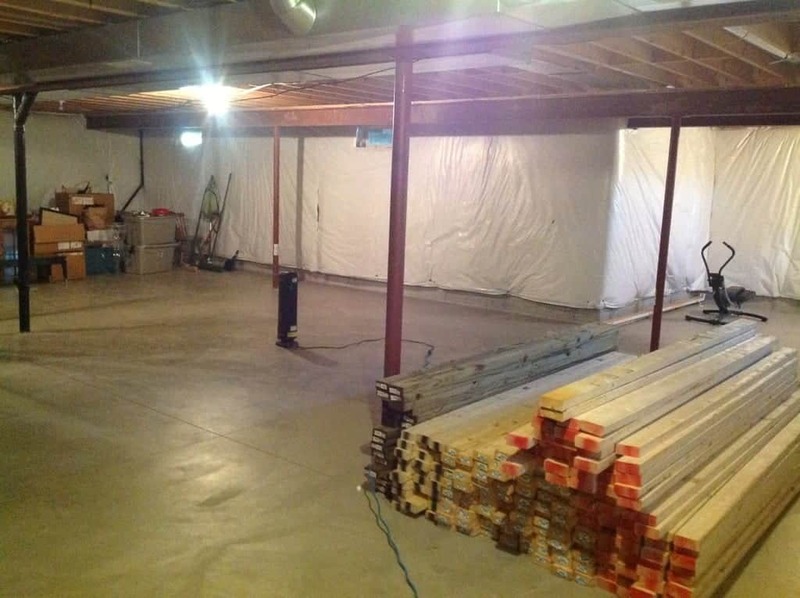 So we needed a finished basement! 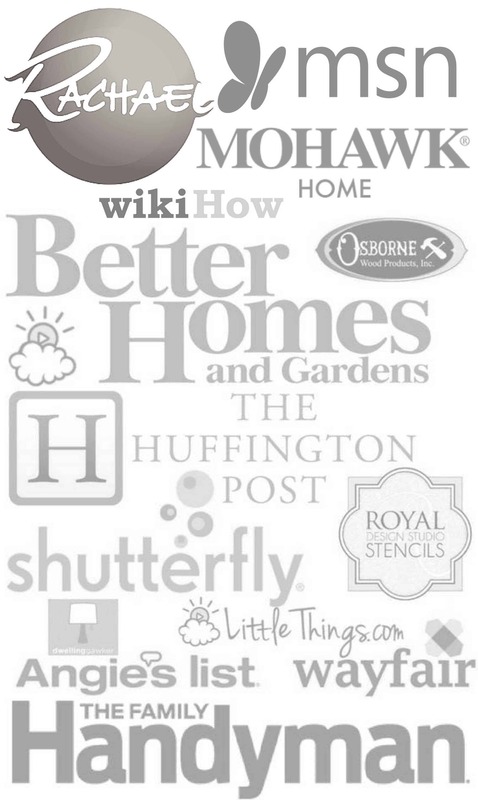 Even though we hired out a contractor for the build, our DIY contribution on this project wasn’t small. 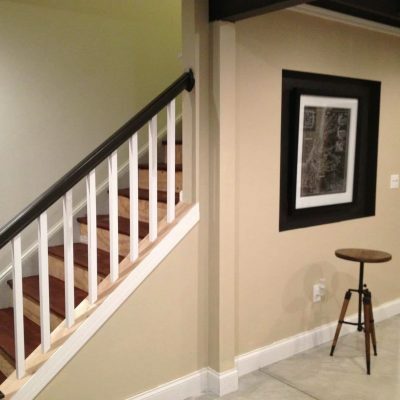 We created the floorplan, and all the finish work (like the trim we did upstairs). 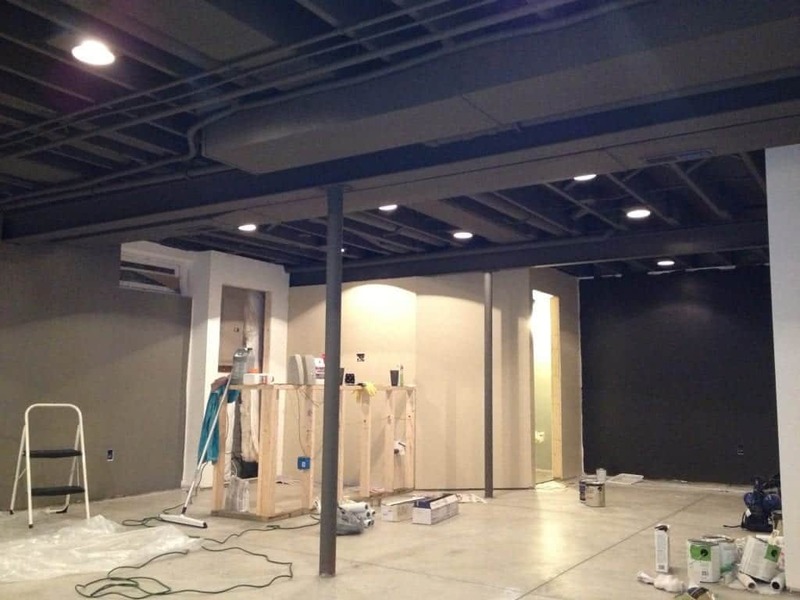 We chose to hire a contractor to install drywall, trim, electrical, plumbing and hung doors. I am not altruistic when it comes to DIY; I do it myself when it makes sense. At some point, DIY has allowed us to “pay it forward” to hire contractors as needed. 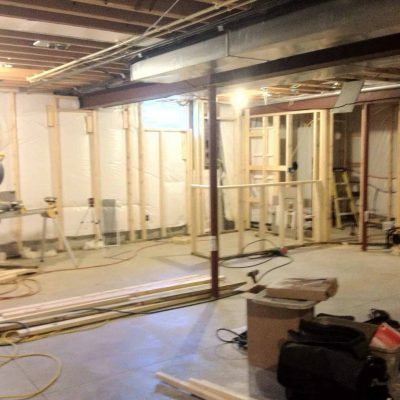 So now the fun begins and we start the finish work and giving the basement some “personality”. 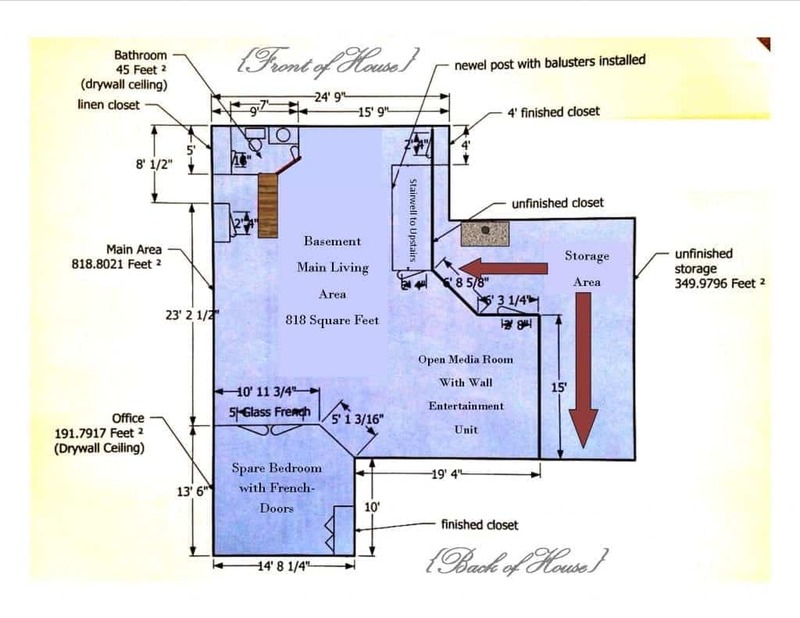 1) 818 additional square feet of living space. (Now this space is a fully functioning in-law suite). 3) The complete addition of a full bathroom with a standup shower. Pictures of this to come! (we had our contractor alter our sewer lines and drilled through concrete). A teenage paradise. 4) The addition of a full guest room (with glass French doors). This is now being converted to a studio / office / craft room. 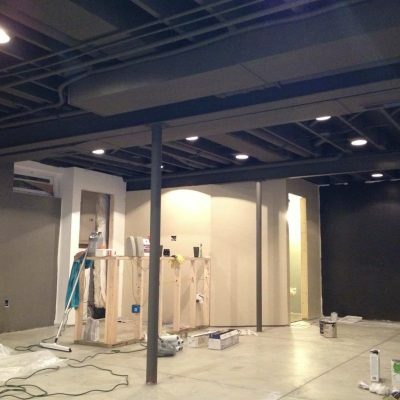 5) Exposed ductwork / painted ceiling. (Saving us $2,500 in drywall costs). 6) Polished concrete floors with stencil application (soon). 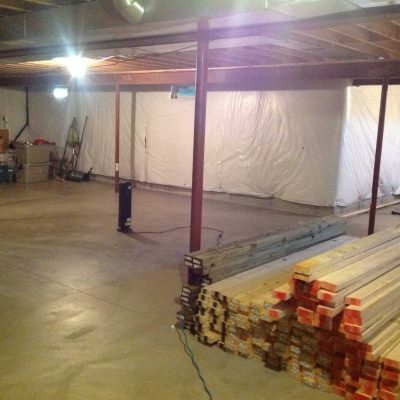 At the time I built my house I paid $4000 to eliminate a crawlspace and opted for a full basement. I’m so glad I did. A crawlspace would have prevented me from claiming 350 square feet in our house. From 2005 until now, it was for roller skating, dodgeball and bike riding. It definitely served its purpose, so I am happy that I bit the bullet years ago. New Home Building Tip: (always, always, always upgrade square footage when building your home!) 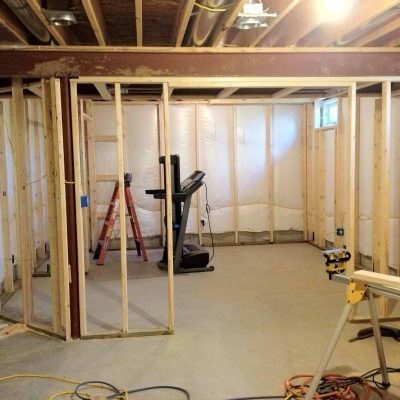 I prioritized my new home building costs towards square footage upgrades, and saved my budget on finish work, (which I could always DIY later). From the bottom of the stairs…looking towards the future bar and the bathroom. 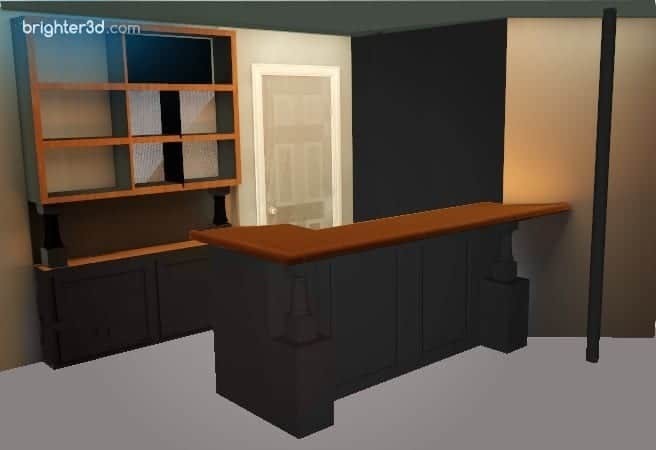 Basement bar (our idea), but as of now it remains just a drawing. Our utility door isn’t the prettiest so we struggle with what to do with that space. We LOVE the results, but as we recover financially from the construction investment (to the tune of $16,000 to be exact) we still feel we did the right thing and gave our kids a space they are already enjoying. Our daughter now has a private bedroom and bath (huge win). 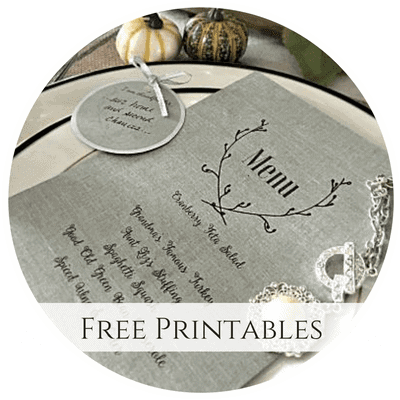 Another huge savings – no carpeting. We also intend to stain and polish the concrete floors and put down huge, fluffy rugs. If we sell the house, we don’t have to deal with picky buyers who want the carpet ripped out. I realize this is not everyone’s taste, but for us, it was an economic way to solve a problem plus we created an overflow space for our growing family. 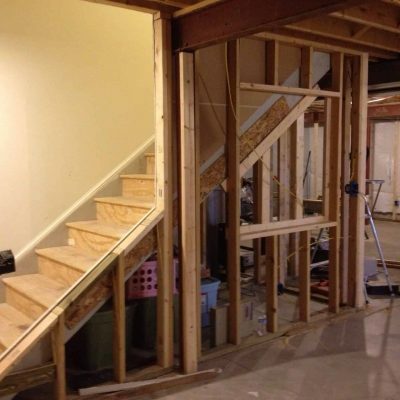 An open design house (upstairs) doesn’t offer us much privacy…and now we have our “man cave”. Absolutely love the basement remodel!!! What color is the light sand color!?! 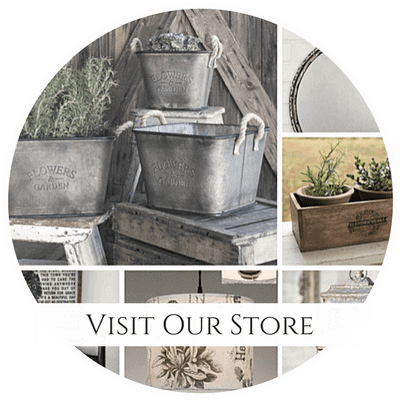 Hi Terri, our paint cans are missing from this room but I’ll edit my reply here once I find them and give you the exact formulas, and thank you! Did you ever find the color for the basement? My husband loves loves loves the colors! 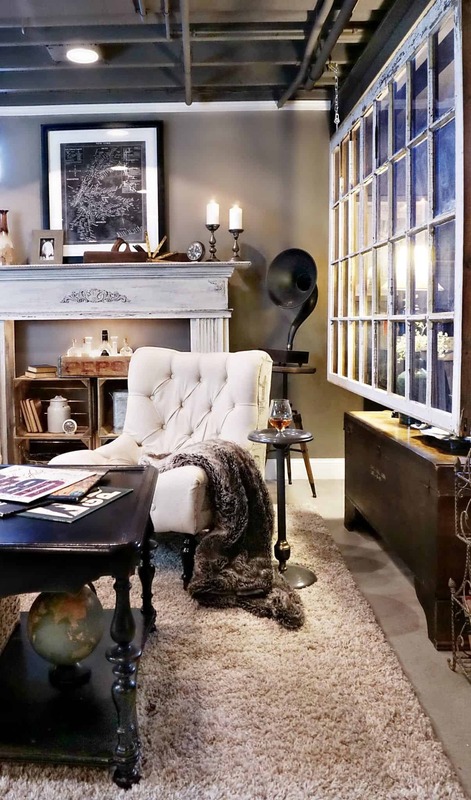 We’re planning on doing the same thing with our basement with respect to the ceilings and industrial look. 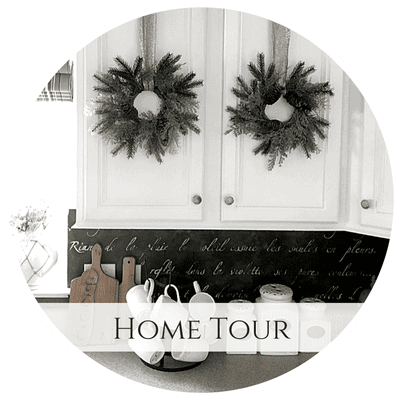 What did you use for the crown molding? We left the metal columns exposed, we haven’t spent much time in the basement and my goal is to enclose them in a wood casing someday. 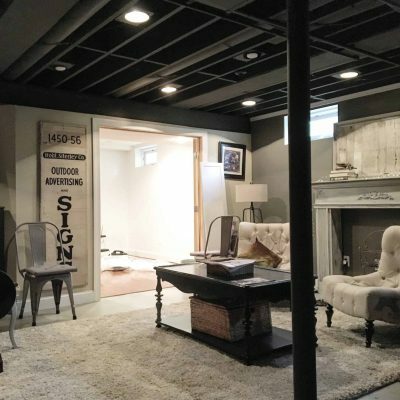 Hi, I am currently in the process of doing a very similar basement project – can you tell me what paint color you used on your ceiling? Thank you. Yours looks great! 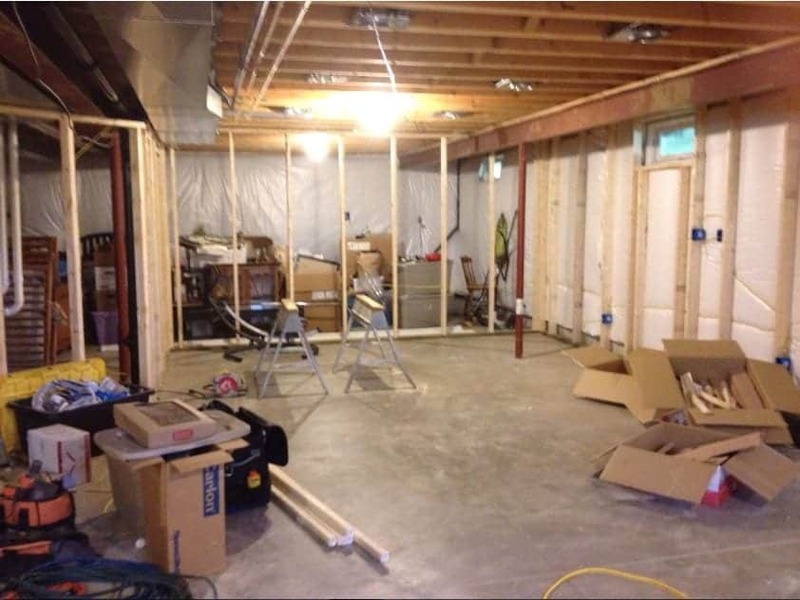 Thanks for sharing your progress on your basement. 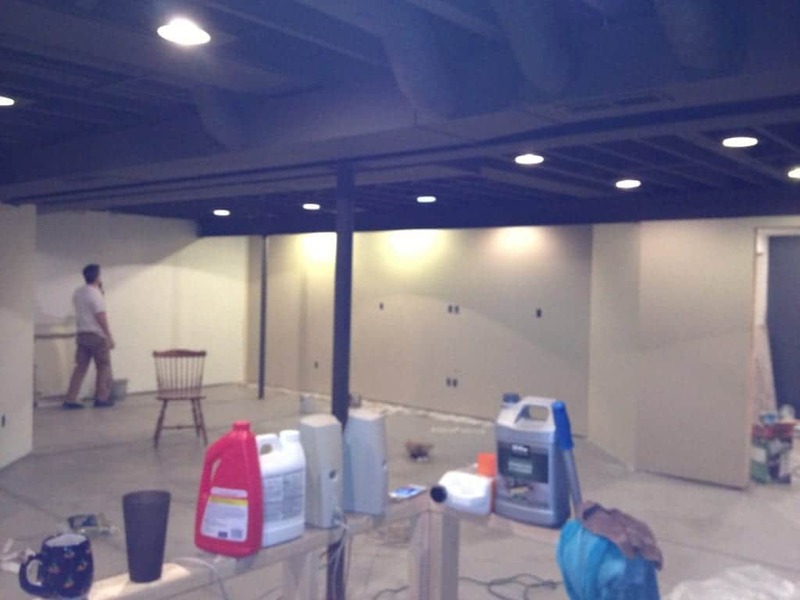 We are in the works of finishing our basement and love the exposed ceiling. For your bathroom and/or bedroom, did you also do an exposed ceiling? 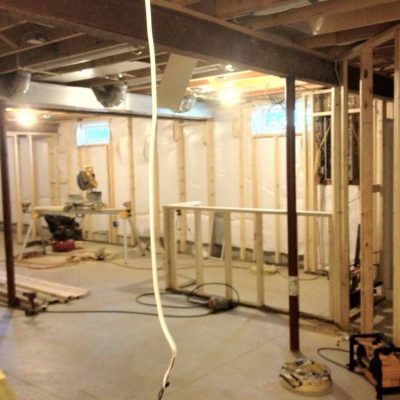 Or did you enclose/drywall the ceiling? And great idea for the flooring. Curious on the tempeture, do you find it colder in the basement since you didn’t add carpeting? My goal is to have my teen boys in a room in the basement and I wonder if I could get away w/ just finishing the floors (and adding a rugs) vs adding carpet. It can get pretty cold in WI. Thank you we left the ceiling exposed and had it painted for $300. Very messy but worth it! The flooring temperature is about the same in the summer as it is in winter. 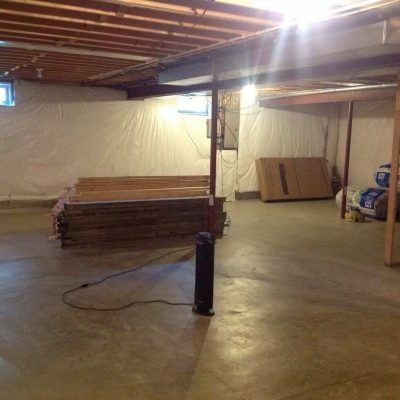 In fact, we think our basement is too cold in the summertime but more comfortable in the winter because that’s the level that our heating and cooling is on. Carpet does wonders, too which is all we’ve put down on our floors expect for the bonus room which has laminate flooring. Hope this helps! What color is your basement ceiling? Love the color. What is the paint color of your ceiling? I love it! Love the exposed ceiling and color. What color is it if you don’t mind me asking? Hi Tiffany, thank you! I tried to send the paint formula but the email bounced. I will update the post to include the ceiling paint color, lots of people have been asking for it. We love your color scheme!!!! What color was the ceiling and the walls? We have the same basement set up and have been searching for the perfect one an yours is it!!! We are mudding the walls today and tomorrow and should be sanding soon. Thank you in advance! My husband thinks it’s black but the image suggests a rich chocolate brown ceiling and single wall. Can’t tell by the pictures. Melissa, I’ll have to dig up the codes since, so be prepared for long complicated codes instead of color names. 🙂 Will update you soon with that information. 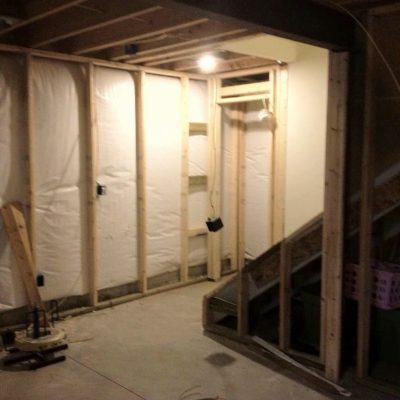 Your basement looks fabulous! 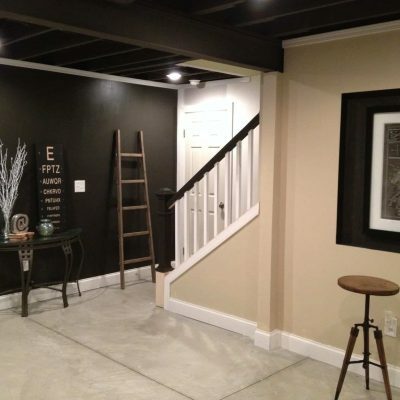 Could you share your paint colors used in your basement? I wasn’t able to find them in your post. 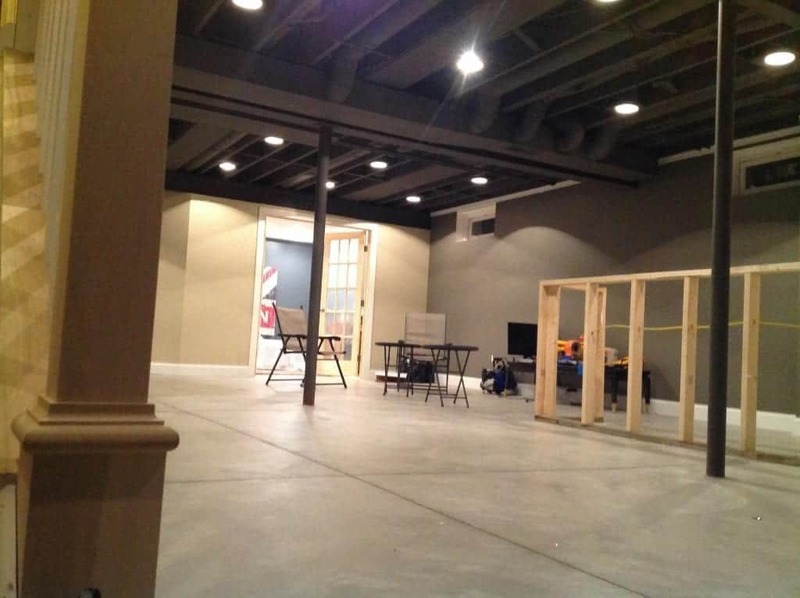 Hello, your basement is gorgeous. I also am very much hoping to learn the ceiling and wall paint color. It’s perfect ! 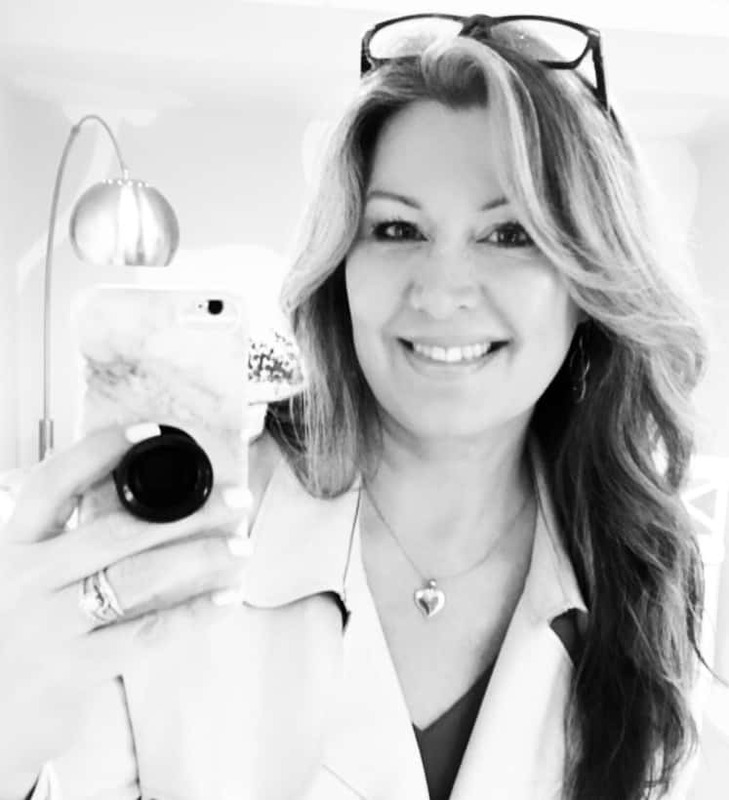 Thank you so much, your post inspires me. What color is the basement ceiling?